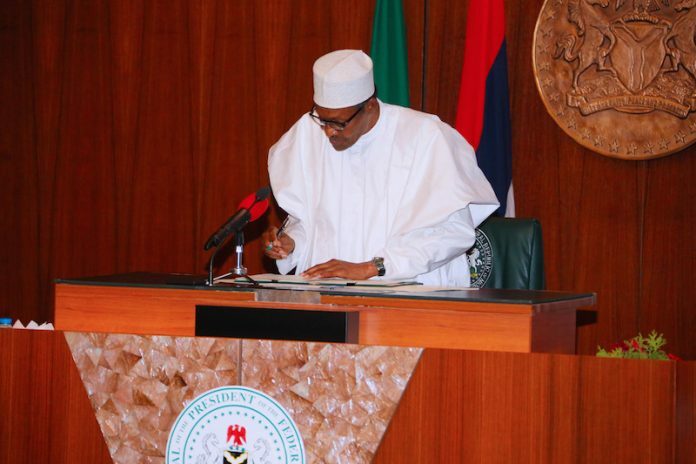 President Muhammadu Buhari has Assented to the Federal Competition and Consumer Protection Act, 2019, which establishes the Federal Competition and Consumer Protection Commission as well as the Consumer Protection Tribunal to try violations. Presidential Liaison to the National Assembly – Senate, Senator Ita Enang, in a statement, on Wednesday said the law is to promote economic efficiency, maintain competitive market in the Nigerian economy. It will also protect the Nigerian economy, protect the interest and welfare of consumers by providing consumers with wide variety of quality products at competitive prices as well as prohibit restrictive or unfair business practices in the Nigerian economy, he said. The new law according to Enang “repeals the Consumer Protection Council Act and sections 118 – 128 of the Investment and Securities Act. He listed further functions of the Commission to include, among others: (a) initiate broad based policies and review economic activities in Nigeria to identify anti-competitive, anti-consumer protection and restrictive practices which may adversely affect the economic interest of consumers and make rules and regulations under this Act and any other enactment with regards to competitions and protection of consumers; (b) advise the Federal Government generally on national policies and matters pertaining to all goods and services and on the determination of national norms and standards relating to competition and consumer protection and (c) report annually on market practices and the implications for consumer choice and competition in the consumer market. Others are (d) eliminate anti-competitive agreements, misleading, unfair, deceptive or unconscionable marketing, trading and business practices; (e) resolve disputes or complaints, issue directives and apply sanctions where necessary; (f) create public awareness through seminars, workshops, studies and make available information with regard to the exercise of its powers and performance of its functions to the public; (g) regulate and seek ways and means of removing or eliminating from the market, hazardous goods and services, including emission, untested, controversial, emerging or new technologies, products or devices whatsoever, and cause offenders to replace such goods or services with safer and more appropriate alternatives; (h) publish, from time to time, list of goods and services whose consumption and sale have been banned, withdrawn, restricted or are not approved by the Federal Government or foreign governments and (i) encourage trade, industry and professional associations to develop and enforce in their various fields quality standards designed to safeguard the interest of consumers. He said the Act “has accordingly, upon Assent been remitted to the National Assembly/Appropriate Authorities as law of the Federation”.